From the international bestselling author of the Broken Empire Trilogy, the thrilling conclusion to the Red Queen's War... Mark Lawrence's 'epic fantasy' (The Washington Post) continues as a reluctant prince returns from the bowels of Hell to engage in his greatest battle yet-among the living and the dead. All the horrors of Hell stand between Snorri Ver Snagason and the rescue of his family, if indeed the dead can be rescued. For Jalan Kendeth, getting back out alive and with Loki's key is all that matters. Loki's creation can open any lock, any door, and it may also be the key to Jalan's fortune back in the living world. Jalan plans to return to the three w's that have been the core of his idle and debauched life: wine, women, and wagering. Fate however has other plans, larger plans. The Wheel of Osheim is turning ever faster, and it will crack the world unless it's stopped. When the end of all things looms, and there's nowhere to run, even the worst coward must find new answers. 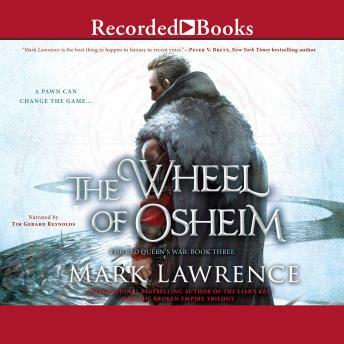 Jalan and Snorri face many dangers, from the corpse hordes of the Dead King to the many mirrors of the Lady Blue, but in the end, fast or slow, the Wheel of Osheim always pulls you back. In the end it's win or die. I loved the first book in this series, this one spent too much time on a battle. It just went on and on. But the rest of the book was good. The author has a great sense of humor that makes me laugh out loud sometimes. All in all, a good read.